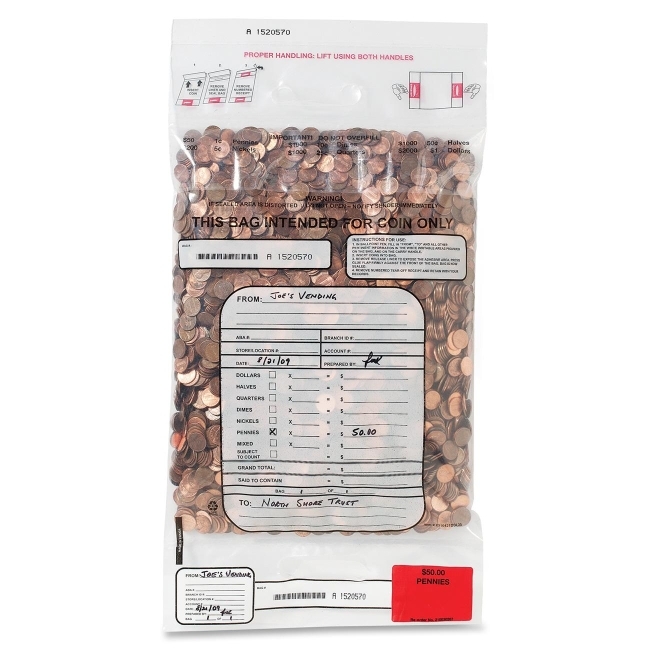 Self-sealing coin bag with double handles is specifically designed for shipments of loose coins and for use by armored car companies, financial institutions, national vending companies, retailers and casinos. Tamper-resistant permanent-adhesive closure seals safely and securely. Made of a clear, three-ply, strong film with durable side seams, the film is specially blended to reduce tearing and provide stretch - holding up to 55 lb. of coins. 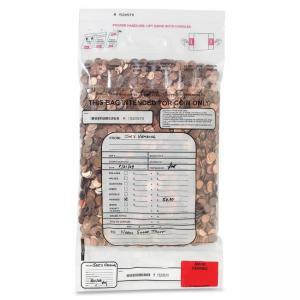 Ergonomically designed, coin bag meets, or exceeds, the standards of the Coin Processing Industry, Federal Reserve and OSHA. Top-loading design eases bag mounting to coin sorters. The bag features a writable surface to record contents; the alphanumeric bar code and tear-off receipt provide internal tracking. The bag's low slip texture makes the bag ideal for stacking. Air vents on the bag release trapped air and moisture when the bag is sealed.